Many men don’t moisturise because they think doing so is too feminine. Here we are going to take a look at why women moisturise, the benefits of daily moisturising, and why men should moisturise too. Women moisturise for several reasons. Mainly they moisturise because they want to look their best. Applying moisturiser every day will keep their skin looking soft and smooth, and is all part of their daily beauty routine. It is the same reason why they put on eyeliner and lipstick, and why they like to look after their hair. Women like to look their best, and applying moisturiser every day is just another part of that. However, moisturising is also important for the health of a woman’s skin. Daily washing strips the skin of its oils, and without applying a moisturiser the skin would be very dry and become cracked and unhealthy. Looking at the main reason why women moisturise, this gives us a clue as to why many men don’t like to moisturise. They associate it with the whole feminine beauty regime, so just as they wouldn’t want to apply eyeliner or lipstick they also don’t want to appear girly by applying moisturiser. Many men think that being a man is all about being tough, and while that is true, is it really such an indication of weakness or lack of masculinity to take care of your skin? So, men like to be tough and assert their masculinity, but is it really so masculine to have bad skin? 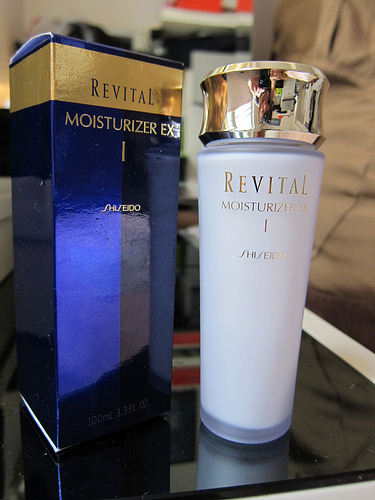 By moisturising every day will not only make your skin feel better, you will also look better. Women like a man who looks good, and this includes a man with good skin. Also, if you moisturise on a daily basis, you will be keeping your skin healthy, which will mean you will age better than men who fail to moisturise just because of some silly outdated idea that it is too girly. By aging well, you may become a distinguished mature gentleman like George Clooney. You would probably be shocked if you knew what his personal grooming routine was like. – Glycerin: this ingredient attracts water and will therefore keep your skin hydrated. – Shea Butter: this has good hydrating properties, a rich texture, and rapidly penetrates the skin. The end result is smooth skin without any oiliness. – Silicone: a water binding agent which gives long-lasting protection. However, too much can make your skin greasy. – Great Tea: a great source of antioxidants. ‘Why Men Should Moisturise Too…’ was written in collaboration with jacksmalegrooming.com, home of male grooming products.